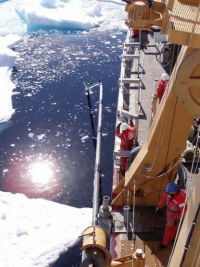 The BPCRC sediment core repository archives marine and lake sediment samples collected from the Arctic Ocean and the Eurasian Arctic margin on the NSF-OPP and ONR-sponsored projects since 1992. 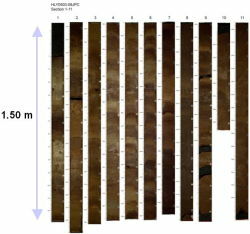 The collection was significantly expanded by the addition of cores from the 2005 Healy-Oden Trans-Arctic Expedition (HOTRAX) — the first complete geological-geophysical transect across the central Arctic Ocean. Currently the BPCRC collection contains >600 m of sediment core material. The core information is searchable via the Index to Marine and Lacustrine Geological Samples (IMLGS). 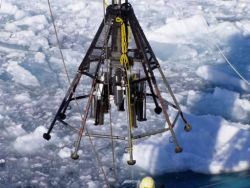 Considering the expensiveness of research cruises to the high Arctic, this material and derived data constitute a highly valuable contribution to the infrastructure of the U.S. marine geological and paleoclimatic research. The repository is a 10 × 15 × 4 m refrigerated unit with controlled temperature. Sediment cores are stored wet in D-tubes on shelf racks. BPCRC also has a spacious sediment laboratory that includes a 6-m-long center table and equipment for sediment sample processing such as a 4.5–l freeze dryer, drying ovens, centrifuge, ultrasonic bath, precision balance, etc. Page last updated on Fri Oct 23 2015.